JNN 13 Feb 2014 Karachi : Pakistani Taliban, whose intermediaries are currently holding peace talks with the government, Thursday claimed responsibility for an attack on police vehicles in Karachi that killed at least 12 police officers and injured dozens others. 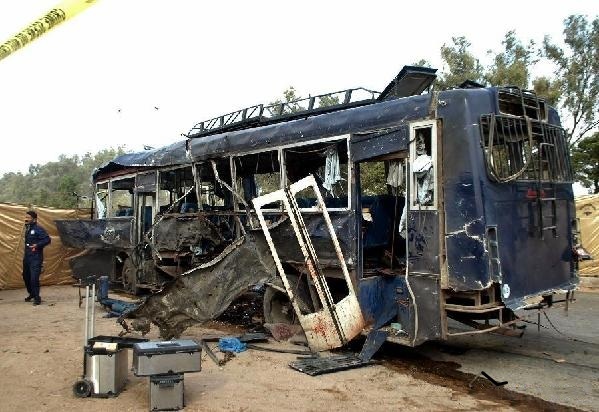 The bomb hit a police bus and van when they were heading for duties. The Taliban spokesman, Shahidullah Shahid, said the attack was aimed at taking revenge of Taliban members who have been killed in Karachi and other cities in recent days by the police and Rangers. “Our 20 members have been killed in encounters in a month,” Shahid said in a statement. It is very sad to see the Pakistani Govt bend on their Knees to facilitate the Saudi Sponsred Taliban Terrorist, while they are killing the Innocent Pakistani Citizens. The Lot of Pakistani Politicians , Bureaucrats , and Members of the Judiciary who are on the Pay Roll of the Saudi Monarchy and the US Govt , and have earned Benefits for more than three decades , in creating the Mess which was created by the then President Zia ul Haq, who dragged the whole Nation into terrorism and Corruption , for his Personal Benefits , who not only sold the Weapons and the Most vital Interests of Pakistan to the enemies of Pakistan , And now his off Shoots and Off Springs have brought Pakistan Near to a total Disaster . And as the Taliban and their Ideological Off springs have been Nurtured in every part of Pakistan, as they have been well placed in the Most strategic Parts of Pakistan , to control the Nervous System of Pakistan , But the Sons of Soil and the True Patriots of Pakistan , especially the Shia Community have Openly challenged these Taliban Devils , and have confronted them at each and every level , Making them their most vicious enemy . As now it is the time for Do and Die Situation , to save the Pakistan from the Taliban Terrorist as if now they are not being encountered , then the Integrity of Pakistan is 100% at stake , and they as per their Plan will tear apart the First Muslim Nuclear State of the World into several Parts , and the Saudi Monarchy which is even investing heavily in these Taliban Terrorist ,working on their One Point agenda of acquiring the Nuclear Weapons of Pakistan , with the help of these Talibans . To become a Nuclear State by a Planned State Dacoity . This entry was posted in Asia Pacific, Pakistan News and tagged Karachi, pakistan, Pakistani Taliban, taliban, the Taliban. Bookmark the permalink.